This article was updated on 1/8/19. Happy Bubble Bath Day! Learn how to diagnose and fix toilet problems including not flushing completely, filling slowly, and a stopped up toilet. Learn why low flow toilets can be a problem. This article addresses fixing common toilet problems. Toilet problems. Like toothaches, everybody has had them at one time or another. Whatever the problem is, troubleshooting and fixing common toilet problems is a homeowners must-have skill, as are other plumbing repair jobs. First, know that there are two different toilet valve types: ballcock fill valve types and float cup fill valve types. The ballcock fill valve is quite a bit older and not encountered as often as the newer float cup fill valve type. The difference between the two is water supply hardware. Not rocket science. The ballcock uses a ball that floats on the waters surface. The float cup travels vertically on the fill tube. Here are a few types of common toilet problems and how to resolve them. Toilet trivia: Do you know where the term "spend a penny" came from? As in, "Wait up, guys, Ive got to go spend a penny." Well, when public toilets were first introduced in jolly old England, they were not free; it cost a penny to use one. A stopped up toilet bowl is the most common problem so its a good place to start. This is the last thing you need when you are seated enjoying the newspaper and the days first cup of coffee. 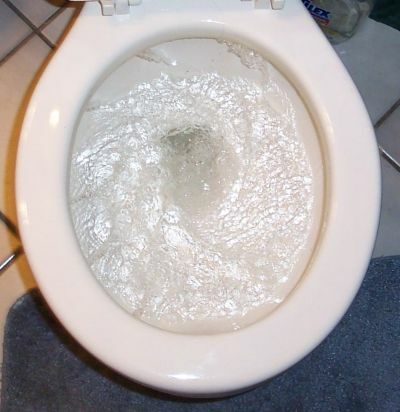 To start with, looking in the bottom of the toilet bowl reveals a round opening. Where this opening disappears from view the opening takes on an elliptical shape. Logically, that which disappears from sight might become lodged just a couple of inches beyond view. That recently deceased goldfish, for example. Dont do that. The basic and first solution is to use a plunger. Every home should have one. Seat the rubber end of it in the bottom of the bowl with the best seal possible. Plunge in and pull back out while retaining the seal. If water splashes out, too much force is being used. The water should soon go down of its own accord. If the plunger doesnt clear the blockage, a toilet auger (closet auger to our British friends) should be used. They may be rented in some areas. Theyre also available at home improvement stores for a reasonable price. 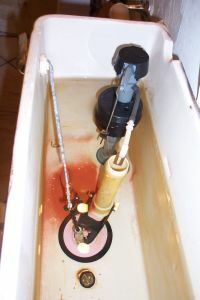 When the toilet runs constantly, chances are that water is running into the overflow tube because the ballcock or the float cup needs adjustment. The ballcock link has an adjustment clip that can be pressed and lowered. With a float cup type, find the adjustment clip on the side of the float cup. Experiment with the placement. If this still does not make the toilet stop running, be sure that the refill tube that goes from the fill tube to the overflow tube is just above the overflow tube, not going into it. The final thing that will make the toilet run constantly is a defective fill valve seal. This will need replacement. It is an easy fix that does not involve calling a plumber, just a trip to Home Depot. The most likely culprit when the toilet takes too long to fill is a clogged fill valve tube. Shut off the water supply valve at the wall. Remove the hardware on the top of the tube to gain access to the toilet fill valve tube. Now use a bottle brush or length of stiff wire to clear anything in the tube. Hold a glass over the fill tube and open and close the valve several times to flush out the tube. Reinstall the hardware. This should fix this problem. This can be a problem with the first-generation low-flow toilets. Unfortunately, the effort to save water had backfired when multiple flushes are required. Another problem can be clogged entry into the bowl. If you own one of these older low-flows, save yourself a lot of grief by just spending a hundred bucks and buy a new one. But first, try looking under the rim of the toilet bowl. See a series of entry holes? Clean each one, ensuring that water flows freely. Finally, examine the flapper in the bottom of the toilet. Is it old and rotted? Is it seating properly? Is the chain too long, causing it to hang up? Just replace the flapper and adjust the chain to 1/2 slack. These toilet troubleshooting and repair tips should solve most toilet malfunctions. Use them and save on service calls from the plumber. Of course, many people just dont want to mess with toilet repair work themselves in any case. Is this you? If thats the case, keep in mind that a plumber has a lot of overhead and will be more expensive than an all-around handyman. Choose which one you want to employ; sometimes a neighbor will be glad to help you. Clear a Clogged Drain? Dont Panic! There is also, of course, the clogged drain; this can be fixed with a plunger or any number of devices that can be found at the hardware store. For the really tricky clogs, however, its recommended that you call in a plumber — itll cost you more, but its guaranteed to get the job done right. Finally, here is a good tip. Lord forbid the water service should go out, but it happens. Be able to fill the toilet tank by having a rainwater harvesting barrel. I hope this article on fixing common toilet problems has helped you and saved you some money on repair jobs. If so, please pass this page on to your friends and co-workers! And share any comments below!